This composite image of the Perseus Cluster combines data equivalent to more than 17 days of observation time over a decade. Image Credit: X-ray: NASA, CXC, SAO, E.Bulbul, et al. 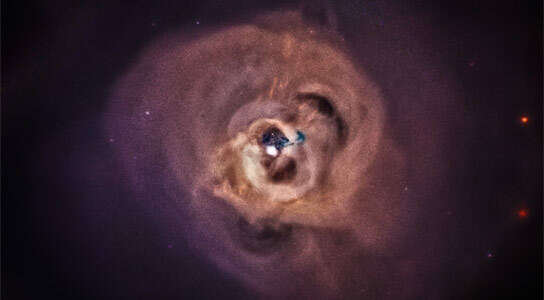 Using data from NASA’s Chandra X-ray Observatory and ESA’s XMM-Newton, a new study of the Perseus galaxy cluster has revealed a mysterious X-ray signal. A team of astronomers has used NASA’s Chandra X-ray Observatory and ESA’s XMM-Newton to study a large group of galaxy clusters with a surprising result. Galaxy clusters are the largest objects in the Universe held together by gravity, and thus can reveal lots of information about the cosmos. This most recent study, which included the well-known Perseus cluster and 72 others, has uncovered a mysterious X-ray signal. Astronomers are intrigued by a spike of intensity at a specific wavelength of X-ray light in the data because of one proposed explanation. Scientists think that a hypothetical particle called a sterile neutrino may, in fact, be responsible for this spike of intensity. Some scientists have proposed that the sterile neutrino could be a candidate for dark matter, something that makes up about 85% of the Universe yet does not emit or absorb light. While they are excited about this finding, the researchers say it’s too early to claim whether or not this mysterious X-ray signal is real, or whether or not it is indeed the signature of the sterile neutrino. They’ll keep gathering data and looking at other galaxy clusters to make sure they see it elsewhere. In the meantime, they’ll be looking at their theories to see where else the physics may take them. One source of uncertainty is that the detection of this emission line is pushing the capabilities of the two observatories in terms of sensitivity. Also, there may be explanations other than sterile neutrinos if this X-ray emission line is deemed to be real. There are ways that normal matter in the cluster could have produced the line, although the team’s analysis suggested that all of these would involve unlikely changes to our understanding of physical conditions in the galaxy cluster or the details of the atomic physics of extremely hot gases. The paper describing the new Chandra and XMM-Newton observations appears in the June 20, 2014 issue of The Astrophysical Journal. NASA’s Marshall Space Flight Center in Huntsville, Ala., manages the Chandra program for NASA’s Science Mission Directorate in Washington. The Smithsonian Astrophysical Observatory in Cambridge, Mass., controls Chandra’s science and flight operations. Image: X-ray: NASA, CXC, SAO, E.Bulbul, et al. 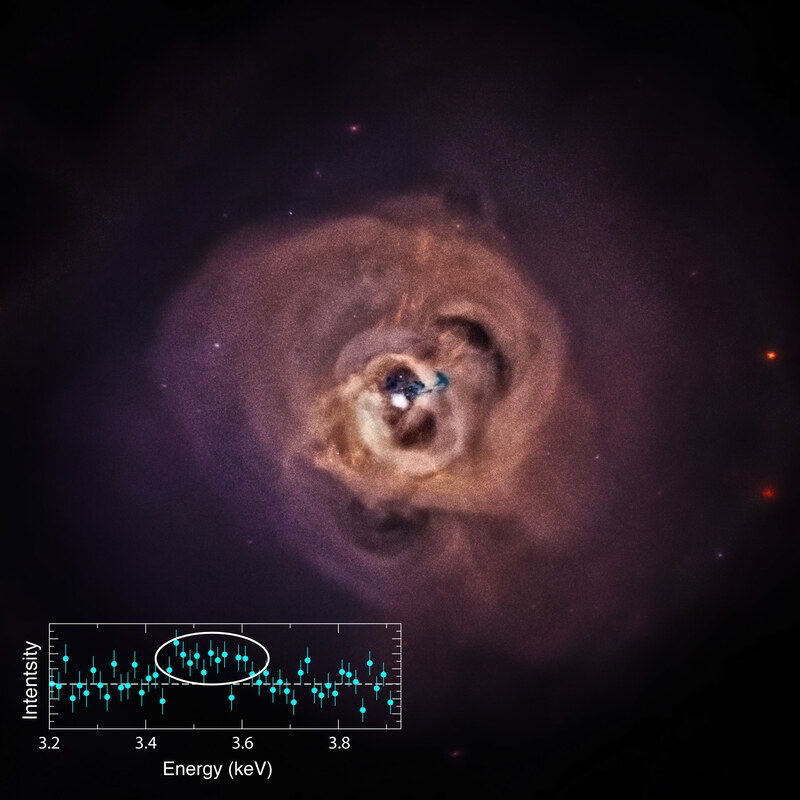 Be the first to comment on "Astronomers Discover Mysterious X-Ray Signal in Perseus Galaxy Cluster"